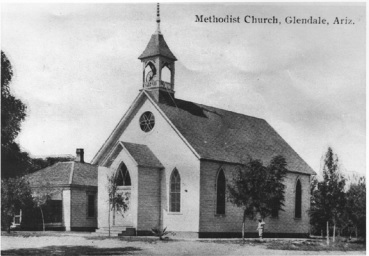 The First United Methodist Church of Glendale was established in 1894, just two years after the original Glendale town-site was platted. 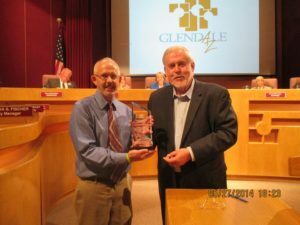 The Church has served the community uninterruptedly from its early years of serving Methodists from both Glendale and Phoenix. Th first worship services were held at the Alhambra School but people living in Glendale wanted a closer place to worship and soon families were gathering at the present location. On October 4, 1894, Reverend J.A. Crouch was appointed as the first pastor for the Alhambra and Glendale circuit. The congregation’s first church, circa 1897. The church was incorporated on June 18, 1897, and property was purchased for one dollar. It was at the present location that the congregation’s first house of worship, a small white frame building was built for a cost of $2,700. The First Methodist Church of Phoenix donated the windows which were lined with paper that simulated stained glass. Two years later, in 1899, the church purchased adjacent property for a cost of one dollar. The early 1900s proved very challenging for the church. In 1903, a carload of gun powder exploded on the Santa Fe tracks two blocks from the church, breaking some of the church windows. Then, in 1904, the area experienced a severe drought and many families moved away. At its low point, the congregation was reduced to six families. Many pastors came and went as the church struggled to continue during this time. In 1912, the Reverend David Roberts was appointed pastor and the church began to experience a period of rapid growth and greater involvement in the community. Reverend Roberts organized the Boy Scouts in Glendale. By 1917, the small frame church was deemed too small, and in September 1918, a committee was appointed to solicit funds to build a new church. Mr. M.L. Fitzhugh drafted the architectural plans for a new building, a grand two-story Gothic edifice, measuring 100 x 70 feet, with a three-story buttressed tower, that would occupy the full ground space at the northwest corner of present-day Glenn and 58th Drives. In the meantime, in March 1920, the small church was sold to the Seventh-Day Adventists and hauled away to their church site by tractor. The congregation met at the Woman’s Club and the grammar and high schools while the new building was being constructed. 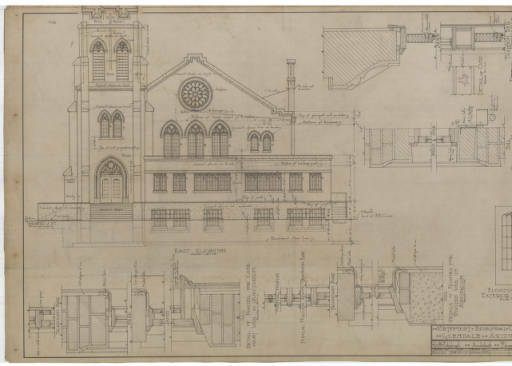 The church board rejected the bids on the original design saying a cost of $60,000 to $80,000 as too high, but contracted to begin construction of the basement and Sunday school rooms. Because of cotton crop failures and other delays, the original cornerstone was engraved April 6, 1920, but was not laid until May 4, 1923. “The church means more than mere brick and mortar and a building to grace the street and town— it is a monument to the spiritual and moral worth of the community. It is an Educational institution, where youth learn not the three “Rs” but the greater truth of God and man. It is a social institution where fellowship is furnished in the highest form. It is an institution which the community cannot and will not get on without, therefore it is founded on something higher than mere material, it is founded on the Chief Corner Stone which is the Head of the Corner Jesus Christ” (The Glendale News – May 11, 1923). The congregation’s second church, circa 1929. At the time of the dedication, only the basement and first story were completed. The building was roofed and the brick walls capped and construction stopped. A miscalculation in the design would have rendered the building unsafe if it had been completed as planned. The congregation moved into this building in July, 1923, and met in the basement for six years. The present sanctuary was designed by Architects G.A. Faithful and L.B. Baker, son of Bishop L.B. Baker of Los Angeles, and W.M. Mullen of Glendale was the contractor. Construction proceeded when money was available, and halted when money ran out. The cost of the sanctuary as listed in the January 27, 1929, church bulletin was $22,960.70. This included the cost of moving the parsonage and furnishing the new building. The new church was hailed as the most beautiful building in Glendale. A dedication took place on February 3, 1929. The sanctuary was built of brick purchased from Dolan Brickyard on Grand Avenue. Granite columns and granite arches over the double-door entry were constructed, and a 50-foot tower rose on the northeast corner of the sanctuary. The church had no cooling system but different businesses provided hand-held paper fans with advertisements. A furnace in the basement pushed warm air through long ducts and out a register on each side of the front of the church. Later, two stoves were installed, and finally a gas-fired furnace with a blower. After World War II, three big evaporative coolers, each 20,000 c.f.m.s, were installed. It wasn’t until a few years after the Fellowship Hall was built in the mid-1960s that the current system of heating and cooling was installed. The church was challenged again in the 1930s with a decrease in membership, when the Great Depression caused many families to seek work elsewhere. During this period, there was talk of selling the property to the Church of Latter Day Saints. However, the sale was prevented by a number of members who made personal loans of $1,000 each to meet the mortgage payments. The women of the church also cooked and served Rotary Club dinners each week for eight years, donating all proceeds to the church fund. It was also in the 1930s that the church name was changed to First Methodist Church, eliminating the word Episcopal. 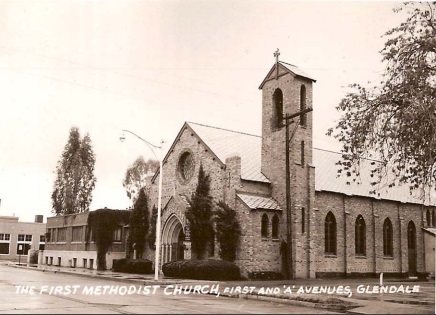 Later, in 1968 when the Methodist Church and the Evangelical United Brethren Church merged, the church became known as the First United Methodist Church of Glendale. A major change to the sanctuary occurred during the 1970s when the original green opaque-glass church windows were replaced with thick, sand-cast, brilliantly colored glass windows which depict scenes of Jesus’ ministry and illustrations of some of the parables of his ministry. The windows on the north side of the Sanctuary depict the teachings of Jesus, while the windows on the south side depict the experiences of Jesus. 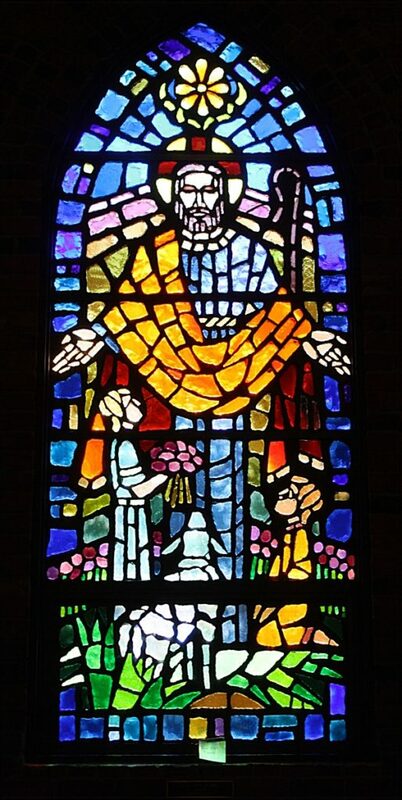 The windows were donated by church families in memory or in honor of loved ones. They were designed by Herbert Menke and fabricated by Judson Studios of Pasadena, California. The mahogany pews and the cylinder lamps that hang from the exposed wooden beams are some of the original furnishings of the church. And each Sunday morning, the peal of the bell in the bell tower calls us to worship. 2014 recipient of the Ruth Byrne Historic Preservation Award. The United Methodist Church of Glendale is one of the oldest churches in Glendale. It was listed on the National Register of Historic Places in January, 2006. However, as Reverend Atkinson pointed out in his message in 1923, a church is more than brick and mortar. The church congregation, through its members involved in United Methodist Women, United Methodist Men, and other church groups, has served the community continuously since it was first chartered in 1894. Community programs supported by the church such as the Westside Food Bank, the Glendale Family Development Center, Boy Scout Troop #62, the Brad Riner Assistance Office, Wesley Community Center, the New Day Center, Justa Center, the Phoenix Homeless Shelter, and Alcoholics Anonymous, has made a difference in our community. We have been proud to be part of these programs and strive to continue our support for them.This congregation also helped to start two sister churches in our conference, Epworth United Methodist Church and Trinity United Methodist Church. Additionally, mission work teams from our church have visited Mexico, Alaska, Africa, Australia, and Fiji.